Hasmeet Singh Chandok wears the familiar red shirt when he goes to his job as a navigator with the Dalhousie Libraries. Since September 2014, Hasmeet has worked for the Dal Libraries, providing IT assistance with a smile. He’s a common sight in the Killam Learning Commons, at the Sexton Help Desk, and in the Wallace McCain Learning Commons. He has also worked at Killam Library Service Point, providing tech support and working as a student assistant. 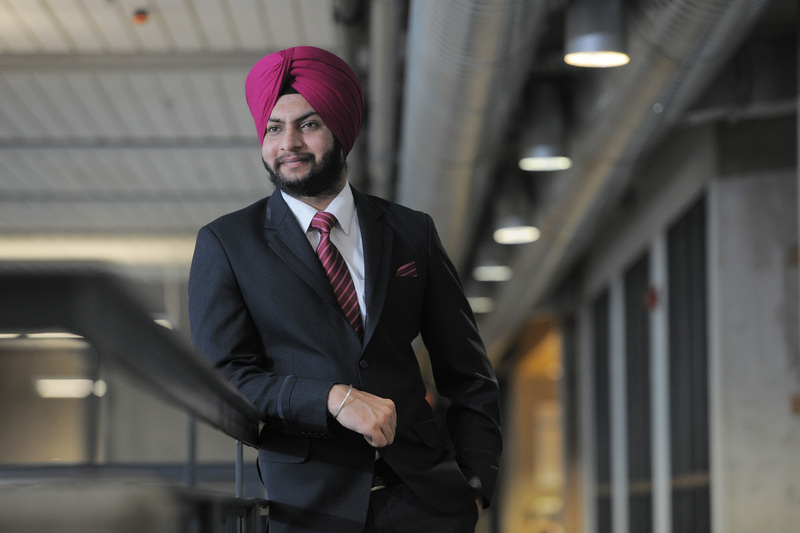 Hasmeet arrived at Dalhousie in September 2013 to study in the Faculty of Computer Science. A high-achieving graduate student, he focuses on Human Computer Interaction. In addition to his studies and his job with the Dalhousie Libraries, Hasmeet was a teaching assistant in the Faculty of Computer Science and kept very busy with a number of extra-curricular activities that often have an altruistic aim. It’s this combination of high scholarly achievement and altruistic activities that have recently earned Hasmeet five awards since his arrival at Dal, plus an honoured spot as a speaker at the United Nations Interfaith Harmony Week event in Halifax in 2014. Some of the great work Hasmeet has done, all while maintaining a GPA of 4.0, includes raising awareness about the Sikh community, including starting the first student association for Sikh students in Atlantic Canada; volunteering with the International Centre at Dal to help new international students get oriented to life in Nova Scotia; organizing a fundraiser to help Syrian refugees that raised more than $200,000; organizing a fundraiser for the Ethopian famine raising between $30-40,000; and, in 2014, serving as Vice-President of INDISA (Indian Student Association of Dal). Awarded by the Computer Science Society, decided by student votes. Awarded for achievement in academics, extra-curricular activities, and promotion of the department, (Hasmeet helped organize Department of Computer Science Information Conference). Nominated by: Dr. Srini Sampalli and Dr. J. Blustein, decided by a committee of professors and a student. Awarded by DSU, decided by the Dean. Awarded to students receiving an impact award who are also graduating this year. Dean of Computer Science; Dr. Ed Leach, Director of the Norman Newman Entrepreneurship Centre; and Qiuling Wu, RCIC International Student Advisor. Five students received this award. Hasmeet’s most-recent undertaking is being a member of the planning committee for the United Nations Interfaith Harmony Week event in Halifax in 2017. “I would like to give a shout-out to all the staff members at the Dal Libraries with whom I have worked in last three years for being such a great support and helping me become what I am today,” he says. I wish you can fight for the injustice and discrimination done by Dalhousie university and it’s professors for your fellow students too.